Since 1970, Design North has been providing custom roofing solutions to the Juneau, Alaska area. We replace approximately 30 residential roofs and a handful of commercial roofs annually. Don’t hesitate to call for free estimates regarding emergency roof leaks, roof replacements (Metal, Shingles, or Membrane), siding, or gutter issues. Design North originally opened its doors in Juneau in 1970 as a general contracting firm, working on all aspects of construction. Over the years, our focus has shifted to specializing in water-proofing and the application of roofing, siding, and gutter products for both commercial and residential structures. 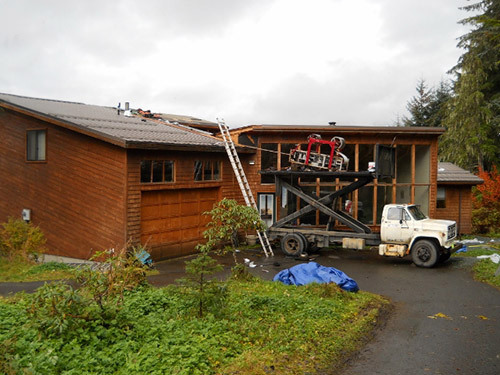 Our background in general contracting, coupled with our focus as a roofing contractor in Juneau insures that you receive competent and reliable service. We have a six core employees with over 110 years of combined roofing/construction experience in Juneau. Our company is fully licensed, bonded and insured for your protection. We’re members of the Southeast Alaska Building Industry. We are certified GAF Master PVC membrane roof installers, both commercial and residential. We’re pleased to offer free estimates to all prospective customers on products and services. We’re on hand for 24-hour emergency leak repair at all hours of the day or night. We stand by our work and provide 5 year workmanship warranties for our roofs. We may be the only roofing company in Juneau that nails shingles and underlayments by hand, as in with a hammer. The hand-nailing method insures that every nail is seated properly and not blown completely through the shingle or underlayment product. It is faster to use a pneumatic (compressed air) nail-gun, but varying air-pressure produces countless over-driven, under-driven, or crooked nails. These improperly driven nails have no holding power and lead to slow weeping leaks that feed attic mold and produce rot. Weeping leaks often go undetected because they are so slow and don’t drip into the living space, all the while irrigating the mold and causing damage. We replace a lot of nail-gunned shingle roofs that are less than 10 years old because of these problems. We believe hand-nailing sets us apart from the competition and is a driving force of our strong reputation for providing long lasting, quality roof systems. We utilize three concealed fastener metal roof panel forming machines and one mobile gutter forming machine. We have a full metal shop to fabricate any custom flashings you may need. We also custom make our own flashings for any roof we install. We stock many colors in 26 gauge steel to make your roofing panels, flashings, and gutters. We can quickly fabricate custom tailored metal roof packages for Juneau and surrounding areas with a focus on getting the products to you un-damaged. Looking to make an upgrade to your roof? Get in touch with us today for a free estimate on superior roofing products and services from our team. "I have personally installed multiple metal roof packages from Design North. All of which have been amazing. Great attention to detail and gr..."
"These guys did our roof last year and was very impressed. A great bunch of guys that obviously know what they are doing and the kept my yard..."